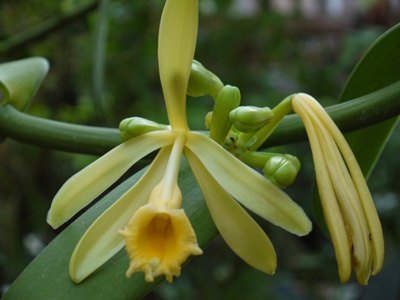 Of the approximately 100 species of Vanilla, only a three are grown for the commercial production of vanilla. Vanilla pompona is one of these, and our plant has burst into glorious buttery bloom this week in the Orchid Display House. Draped over the cedar pergola, the massive vine has produced 13 short spikes, all flowering simultaneously. Pretty though they are, the flower has only a mild scent that bears no resemblance to the fragrance of the fermented seed capsule from which the flavoring is derived. The fleshy seed capsule is commonly called a bean--a misnomer, since Vanilla is an orchid, not a legume. The Fuqua Orchid Center has twenty Vanilla vines planted at the base of the vertical supports of the cedar pergola, including one of the odd leafless species from Madagascar.